Shingles is a painful medical condition that is related to the multiplication and growth of the varicella zoster virus in the nerves of the patient . The Shingles virus is one that a patient already has in them if the patient ever suffered from Chicken Pox as a child. The same virus that causes Chickenpox is the same one that causes Shingles. The illness called Shingles can also be known as herpes zoster or simply as zoster. Shingles being a viral disease can exhibit many signs and symptoms. The virus affects any part of the body without prejudice but is more commonly found on the body torso or trunk, the neck, the face, ears and eyes. The main distinguishing marking of this disease is the rash or blisters that form along one half of the body in a banded or clustered pattern. This characteristic and unique identifying feature of the disease makes it easy to distinguish from other maladies. The cause of Shingles is pretty straightforward and starts with a chickenpox infection. If as a child you once suffered from chickenpox, then the virus that affected you and led you to develop chickenpox, the virus known as varicella zoster still lives inside your body even though you have recovered from the disease. When you fall sick and get chickenpox due to the varicella zoster virus, your body’s immune system responds by attacking and getting rid of the disease causing agent in the body . For some reason, not all the varicella zoster virus in your body is completely destroyed nor eliminated. Some virus remains in your body, under the watchful eye of the body’s immune system. The body’s immune system, when in tip top condition, makes sure that the hazardous varicella zoster virus is kept under check and is prevented from multiplying and growing out of control. The varicella living in your body, resides in the nerve tissue, particularly in the dorsal root ganglion of the body. The virus is living there in a dormant or non-active form and is not interfering with any of the normal body functions. However, the tables turn the minute the body’s immune system is compromised whether voluntarily or involuntarily and the virus is given an opportunity to multiply unchecked because the immune system is too weak to fight the virus. When this happens, the multiplication of the virus leads to the initial symptoms that the patient begins to feel such as moderate pain in certain areas of the body, nausea and headaches, unfortunately all these can also be misdiagnosed as symptoms of another disease. So in essence Shingles may develop in people many years after the first initial infection with the virus. Shingles is not an easy disease to classify in its initial stage with most physicians opting to wait and see if the defining band of rash does not appear. Once the band of rash appears, (on one half of the body, never crossing to the other side) then the doctors can surmise and conclude almost immediately that the patient is indeed suffering from herpes zoster. Of course the doctor’s assumptions must always be double checked to confirm before proceeding with treatment, so swabs are taken from the patient’s affected areas and sent to the laboratory for further testing. The name of the test that checks for the presence of the varicella virus in the body is the Tzanck Test. Once the test results are back then the doctor can make a more informed decision about the way forward and which prescription medications to recommend and give based also on the patient’s history. A patient does not suddenly find themselves suffering from Shingles. There is a progressive stage to the disease . It occurs in a series of symptoms that often begin with feelings of numbness in certain areas of the body, in the dermis or skin surface which may or may not be accompanied by pain that has a burning sensation to it, or a pain that comes in sharp pricks, or tingling sensations. These first signs are then followed by headaches that are localised or affecting one side of the head. If the patient hasn’t gone to see the doctor by then, then week three will surely send them to see the doctor because a rash breaks out onto the skin. This rash can be identified from other diseases because it occurs in one distinctive manner, in that it forms uniquely on only one side of the body. The rash amazingly never crosses onto the other side of the body and is localised on one half of the body. The rash that appears is more commonly found on the body’s main frame, but can be observed along the neck, face, and eye area. The Shingles virus when residing in the body lives in the nerves of the body. The most common nerve that Shingles can be found is the dorsal root ganglion. These viruses are lying there in a dormant or non-active state, and are kept in check by the body’s strong active immune system. Some of the virus can move and reside in other nerves in different parts of the body. 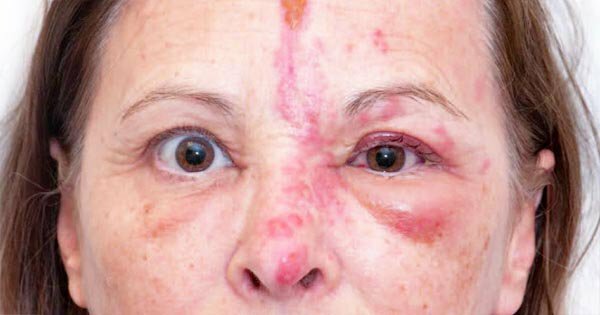 Shingles of the eyes occurs when the virus is reactivated in the body when the body suffers an attack on the immune system and it becomes compromised. A weakened immune system means the virus wherever it is in the body can now actively multiply and increase in number. The viruses that are along the ophthalmic nerve, this is the nerve that feeds into the eye, or supplies the eye with nerve connection, also begin to multiply. When this reactivation of the virus along the optic nerve happens then the eye area will begin to show and display the common Shingles rash. 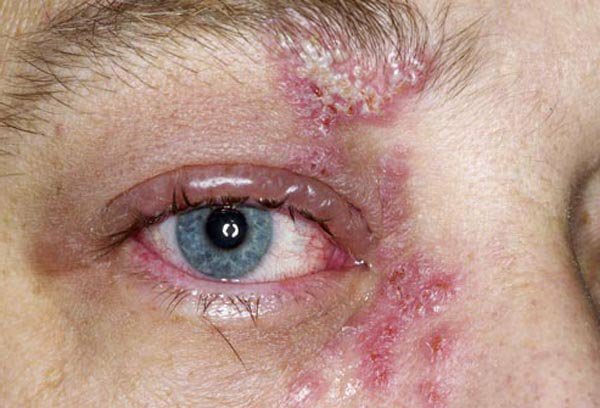 This specific form of Shingles, focussed around the eye area is called Herpes Zostes Opthalmicus. Herpes Zostes Opthalmicus does not always happen because of the virus being in the optic nerve. The virus can get to the eyes simply by contact from a body part that has the virus. Before Shingles has a chance to spread from other body parts, it is the physician’s duty to warn the patient not to touch the face area after having touched a part of the body that has the rash. The patient needs to understand that the virus is in the fluid found in their blisters, and should they touch that blistered area, they should immediately wash their hands to avoid the risk of transferring the virus to another part of their body. Body parts that are generally susceptible to transference are the face and ear area. The cornea is the clear front part of the eye that you see. The cornea is a very sensitive area of the eye. The viruses in the nerve can move and progress to the eye, and affect especially the cornea. When the cornea gets infected, inflammation occurs and can be very painful. This inflammation of the eye is known as Keratitis. The zoster virus can also affect other parts of the eye such as the iris and the choroid, which are collectively known as the uveal tissue . The retina can also become infected and only a thorough examination by an ophthalmologist can fully explain and gauge the extent of the damage done to the eye area. In addition to the general signs of Shingles, when Shingles now affects the eyes the symptoms now are more centred around the eye area and tend to follow a similar course to how the general symptoms occur. First splitting headaches with pain in one side of the head may start off the series of symptoms followed by a puffiness, swelling and pain in the eye and around the affected eye. The affected eye may begin to show signs of discolouration appearing red. The involuntary shedding of tears and blurred vision also begins to occur round about this time. A pre-cursor or tell tale sign of the development of Shingles of the eyes would be the appearance of the rash on the nose. The virus if not in the optic nerve already may then spread from the nose area to the eye area. When the cornea (the front part of the eye) begins to change colour and look slightly gray then immediate care should be taken to avoid further damage to the eyes. Failure to seek immediate treatment could lead to scarring of the cornea and blindness. Most patients will probably see two different doctors when they begin to feel sick. They will most likely go see a general physician and an ophthalmologist. Both doctors should come to the same conclusion and seek to rectify and reduce the patient’s suffering. The easiest way to diagnose Herpes Zoster Opthalmicus is from a clinical examination which is ideally done by the ophthalmologist. Combing the assessment by the ophthalmologist, the physician can then make an overall conclusion and begin a course of treatment for the patient. Most patients diagnosed with herpes of the eye, are older than 60 years of age. If left unattended, this disease can have disastrous consequences. A strong and aggressive treatment must begin as soon as the patient is diagnosed with herpes of the eye or they might risk going blind. Before looking into the treatment of Shingles, we must address the preventative measures people need to take to protect themselves against the disease. When living with a person suffering from the disease, it is important to ensure that the person always covers up their affected blistered areas to reduce the risk of transmission. The affected areas should be washed and dressed with clean new bandages every day, and the hands washed thoroughly after coming into contact with any of the patient’s bandages or affected areas. In general, Shingles is a disease that after it has run its course will slowly disappear by itself. This is the same for Shingles of the eyes. Most prescribed medicines around Shingles are simply for the relief of the unbearable pain. Analgesics are the painkillers which are normally recommended to ease the pain. These pills can be taken as prescribed medicine or simply bought as over-the-counter pain relieving medicine. The area around the eye can also be cooled and calmed by the used of topical creams that have calamine in them. The use of calamine based creams brings a sense of relief and soothing to the affected area. In the extreme cases when the headaches and pain around the eye is too much, then stronger painkillers such as morphine have to be used. When the blisters have burst and have scabbed, then it is safe to use Zostrix on the affected area as well. Antivirals are not always in the list of recommended meds to take, but some physicians may prescribe them because they can aid in decreasing the extent and the length of the recovery period. Two of the prescribed antivirals that can be taken include acyclovir and famciclovir. If a patient is too weak to have their medication administered in the normal manner then, taking the antivirals intravenously is the next option. Although it occurs rarely, there are some individuals who may have a recurring problem with Shingles. In this case their dosage tends to be higher than most peoples’. One other option that has been made available for those suffering from severe acute pain is the use of steroids to relieve immediate pain . Although they work for that moment, they do not seem to reduce the potential of pain in the future. Shingles is a disease that can be treated without much difficulty. The disease only becomes troublesome when it is not diagnosed correctly at the very beginning. It is the patient’s duty to carefully monitor their symptoms and bring any unusual changes to the attention of their physician before the situation becomes dire. Usually within three weeks of the initial symptoms, the patient will develop a marked rash which will help clarify things for the doctor and hopefully a course of treatment can occur. If the patient is not exhibiting symptoms of herpes zoster opthalmicus, then the physician must explain carefully to the patient to avoid touching the eye area in order to reduce the risk of transmitting the virus to that part of the body. In general when caught and detected early, herpes zoster opthalmicus can be treated with considerably reduced adverse effects.